In the Low Countries, stadtholder (Dutch: stadhouder [ˈstɑtˌɦʌudər] ( listen)) was an office of steward, designated a medieval official and then a national leader. The stadtholder was the replacement of the duke or earl of a province during the Burgundian and Habsburg period (1384–1581/1795). Stadtholder means "steward". Its component parts literally translate as "place holder," or as a direct cognate, "stead holder" (in modern Dutch "stad" means "city", but the older meaning of "stad" – also "stede" – was "place", and it is a cognate of English "stead", as "in stead of"), it was a term for a "steward" or "lieutenant". Note, however, that is not the word for the military rank of lieutenant, which is luitenant in Dutch. 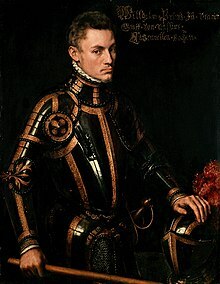 The leader of the Dutch Revolt was William the Silent (William I of Orange); he had been appointed stadtholder in 1572 by the first province to rebel, Holland. His personal influence and reputation was subsequently associated with the office and transferred to members of his house. Maurice in 1618 and William III of Orange from 1672 replaced entire city councils with their partisans to increase their power: the so-called "Changings of the Legislative" (Wetsverzettingen). By intimidation, the stadtholders tried to extend their right of affirmation. In reaction, the regents in Holland, Zeeland, Utrecht, Guelders, and Overijssel, after the death of William II in 1650, appointed no stadtholder. They subsequently were forced to appoint one by the catastrophic events of 1672, the Dutch Year of Disaster (Rampjaar). After the death of William III in 1702 they again abstained from appointing one. These periods are known as the First Stadtholderless Period and the Second Stadtholderless Period. This page is based on the Wikipedia article Stadtholder; it is used under the Creative Commons Attribution-ShareAlike 3.0 Unported License (CC-BY-SA). You may redistribute it, verbatim or modified, providing that you comply with the terms of the CC-BY-SA.